In this study, after an overnight 10-12 hour fast, 9 healthy volunteers were randomly fed 3 test meals and 2 white bread (high glycemic) control meals on separate days. Each meal contained 50 grams of carbohydrate from white bread eaten either alone or in combination with 1, 2, or 3 ounces of almonds. To check subjects’ rise in blood sugar, blood samples were taken for glucose analysis immediately after eating, and at 15, 30, 45, 60, 90 and 120 minutes. 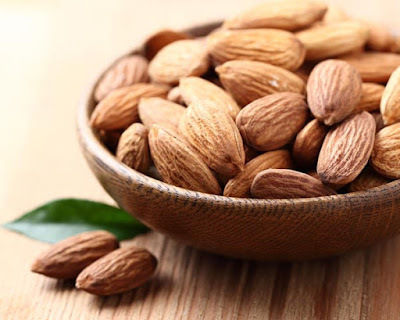 Eating almonds reduced the glycemic index (GI) of the meal and subjects’ rise in blood sugar in a dose-dependent manner—the more almonds consumed, the lower the meal’s GI and the less the rise in subjects’ blood sugar after eating. Subjects’ blood sugar rose 2.8 mmol/L after eating only white bread. When one ounce of almonds was eaten with the bread, blood sugar rose 2.2 mmol/L. Eating two ounces of almonds with the bread resulted in a rise in blood sugar of 2.0 mmol/L, and eating three ounces of almonds caused blood sugar to rise only 1.6 mmol/L—less than half the rise seen after eating white bread alone. Practical Tips: Don’t just enjoy almonds as a between-meal snack. Spread a little almond butter on your toast or down the center of a stalk of celery. Add a handful of lightly roasted almonds to your salad or chop and use as a topping for pasta, steamed or healthy sauteed vegetables. When eating foods with a higher glycemic index, including almonds in the meal can help keep your blood sugar under control.